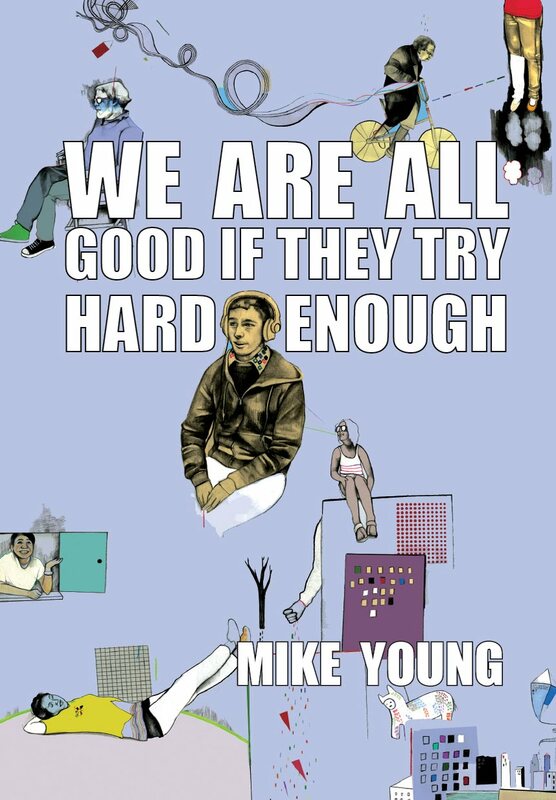 Mike Young’s We Are All Good If They Try Hard Enough reads at first like something disjointed, with lines and images that seem to all bleed into something mostly nonsensical, that leave you wondering the why of what they might be trying to tell you or convey, if they’re trying to convey anything at all beyond sound or silly, because there are poets these days who do only that and you’re not particularly partial to that, you like to communicate with the text. Amateur opera singers do their own makeup. It maybe hurts a little, and if not you at least stop to appreciate the image of installing a face. While appreciating, somewhere far back in your head recalls a title from earlier in the book, “You Can Know That Wait Means Stay,” how it makes those last two words take on a new meaning, a new weight, and you wonder about the earlier poem, this permission granted. You turn back a few pages and read “You Can Know…” again and this time it reads as an ache and a silence, and there it is—a Rube Goldberg machine in the words and pages, these small and big parts, some silly and some more obviously utile, all working for a greater whole—this gathering of attempts at connection, and just as in life some of it falls short, some of it is perhaps a little close to Young’s brainspace for us to really get the exact object or event or maybe even emotion he’s trying to convey, but then there are these shining moments (“Keep the lights on through all loss. Don’t forget: / brilliant also means that none of us can see.”) where you take Young’s title at its word and try just a bit harder. You try so hard you think maybe you’re reaching for something not there, but you go ahead and let yourself reach, let yourself go a little into a space more like where Young may have been while seeing the world and writing it into these poems, and ripcord! You’re off and feeling, and there’s ache and there’s joy and there’s anger and laughter, and you want to shake Young’s hand and call him Mike instead and buy him a gin and tonic and laugh balls. You begin turning back pages and rereading some poems you thought were maybe just simple strings of sounds and where before there was only mouth cartwheels, now meaning and conveyance! and he’s begging you, Mike is actually begging you, “Please listen I have something to tell you. Please tell me I have something.” And you listen. this is so right on, ce, cn. you read one of his poems (or better yet have him read one to you) and you wonder how does this silly sweet thing hurt so much?? I’ve heard some great things about Mike’s readings; hopefully I can catch him sometime. Every SEO campaign begins with good quality keyword research. SEO services can help organizations plan their marketing strategies to achieve better results.